In the vein of such modern-day classics as Ten Little Fingers and Ten Little Toes and The Rabbit Who Wants to Fall Asleep comes an irresistibly sweet goodnight story just right for little ones who need to get the wiggles out before settling down for bedtime. 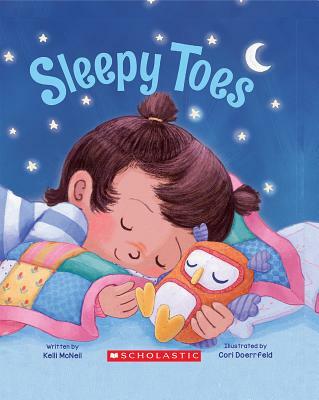 With soothing mindfulness language filled with gentle rhymes by debut author Kelli McNeil paired with adorable artwork by Cori Doerrfeld, this simple story masterfully captivates and lulls readers into slumber -- starting from their tickly toes all the way to their sleepy, blinky eyes! Based on the author's grandmother's special mindful storytelling technique for quieting down rowdy grandchildren, this simple goodnight guide is sure to be a classic bedtime story in the making. Kelli McNeil is a creative director of her own company as well as a children's book author. When not working, she loves being an airplane pilot! She lives in Los Angeles.